Fish farm escapees threaten native river fish communities and boaters as well. Illinois residents along the Mississippi, Ohio and Illinois rivers have been subjected to a strange sight in the past year—flying carp. It's not unusual for bighead and silver carp to land in boats, occasionally bouncing off shocked passengers, injuring drivers and, in some cases, causing damage to the boats. These carp have a habit of jumping when disturbed by the wake of a passing vessel. INHS biologists Eric Ratcliff (left) and Ben Lubinski struggle to lift a trammel net full of 20- to 30-pound bighead carp. Contrary to local lore that these fish are mutant carp from some weird experiment, they are actually escapees from the Arkansas aquaculture industry. In their native China, their fast growth and ability to filter out algae and zooplankton while feeding made them an ideal aquaculture fish species. They were brought into the United States to control the algal blooms in catfish ponds and possibly provide a secondary market as a food item. But when the record flood waters of 1993 and 1995 along the Mississippi River inundated many fish farms, these fish were released into the natural system. The fertile waters of the muddy Mississippi provided a nearly unlimited amount of food for the prolific and fast-growing fish, and soon their numbers skyrocketed. 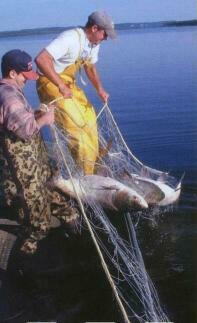 It wasn't long before the largest of the bighead and silver carp were damaging fishing gear. With the potential of reaching 100 pounds, the bighead and silver carp are rapidly moving up the Mississippi, Ohio and Illinois rivers and, like a school of aquatic bullies, taking over critical backwater areas used by many native fish for spawning. A recent backwater fish kill in Missouri revealed that more than 90 percent of the fish occupying the backwater were grass, bighead and silver carp. Biologists monitoring the rapid growth and movement of the Asian carp populations in the river systems in Illinois are concerned. Mark Pegg, the director of the Illinois Natural History Survey Illinois River Biological Station at Havana, worries that the fish pose a serious threat to native fish. "These fish specialize in feeding on zooplankton (small crustaceans) and phytoplankton (small algae), which is the food base for all river fish," Pegg explained. "Larval fish must compete with these filter-feeding carp, and they also risk being eaten themselves." Commercial fisherman have had a tough time selling the plentiful, fast-growing fish. The smaller fish can be scored and sold as a tasty fried fish item like the buffalo fish. The larger fish, however, are difficult to process, and the larger bones do not score easily. This makes them a tough sell to many consumers who expect their fish to be boneless. Besides being hard to market, the fish are tough on boaters and boats, and are considered a potential threat to commercial and recreational boaters. Tales of large bighead and silver carp crashing through the windshields of vessels are becoming common. When a carp the size of a bowling ball smacks into you, it is a potential trip to the hospital. Just ask Eric Gittinger, a fishery biologist with the INHS, who studies the fish populations of the Mississippi and Illinois rivers. Gittinger has the unenviable distinction of being struck by Asian carp 12 times. One hit to his neck was severe enough that he had to see a doctor and undergo physical therapy. He is still suffering from chronic pain related to his injury. "I was hit three times in 2001 and nine times in 2000," Gittinger said. "These things can launch themselves 10 feet vertically in the air and jump up to 20 feet horizontally. Most of the fish that jump are 5 to 15 pounds." Gittinger theorizes that the jumping is a method of avoiding predators. Unfortunately, these fish are here to stay. With established populations on the lower reaches of our major rivers, it is just a matter of time until one crashes into a boat near you.